Antrim’s Seamus McGarry could be in line to make his senior NFL debut against Laois this Sunday after scoring 0-8 in last week’s U21 Football Championship loss to Monaghan Ulster U21 Championship. Antrim Vs Monaghan at QUB's Dub pitches in South Belfast. Antrim's Seamus McGarry lays the ball up to score a point. Photo by Jonathan Porter / Press Eye. HORSE-racing enthusiasts will be paying attention to the going reports at this week’s Cheltenham Festival but Antrim boss Frank Fitzsimons is hoping the drying ground will suit his charges this weekend at Corrigan Park. The Saffrons were narrowly beaten by Louth in Drogheda earlier this month on an extremely wet and heavy pitch. Fitzsimons believes his young, fast team will cope better with a dry ball and a firmer pitch and he could throw one of the rising stars from the Antrim stable into the fray against Laois on Sunday. 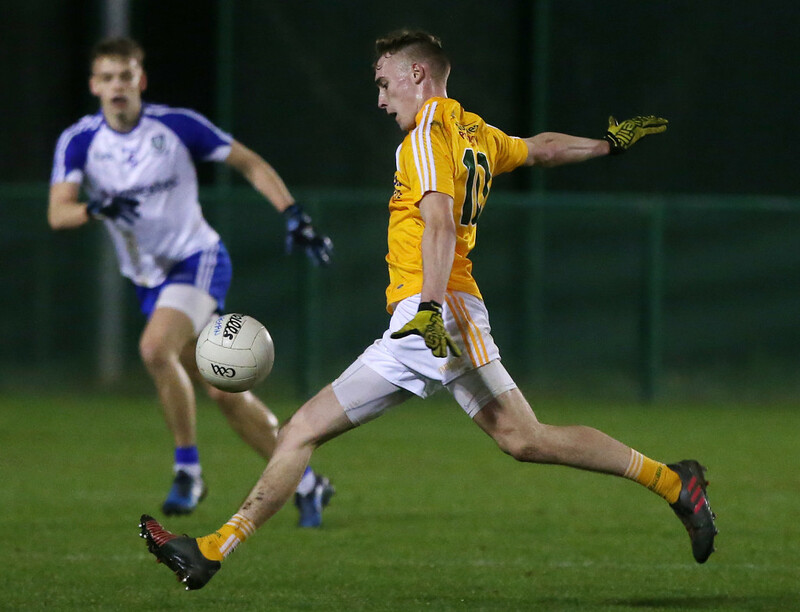 Seamus McGarry’s performance in the U21 Football Championship drew praise from both the Antrim and Monaghan management as the Saffrons suffered a narrow loss at the Dub last Wednesday night. The Aldergrove sharpshooter kicked eight points in the 2-14 to 0-16 defeat with seven coming from play and Fitzsimons feels McGarry is primed to make his National League debut. “I have to be honest, Seamus has been going really well,” said Fitzsimons. “He is one for the future but there is no way the ground in Louth would have suited him. “He was outstanding last Wednesday night – that just shows what he is capable of. “I would say the dry sod in Corrigan might be different. Antrim’s third defeat of the league was perhaps their most frustrating. On a pitch that was barley playable, the Saffrons suffered a two-point defeat to the Division Three pacesetters with both Declan Lynch and Jack Dowling going close with late goal chances. However, it was the earlier misses and turnovers that irked the Antrim management. “We were disappointed with the result. We just didn’t take our chances when they arose,” said Fitzsimons. “When we get chances, we need to keep the scoreboard ticking over. If we were taking our chances, we wouldn’t be where we are at the minute and that has been our problem for a while now. With three games remaining, Antrim can at least look forward to two home games at Corrigan Park. In between the home ties against Laois and Longford, they travel to the Athletic Grounds to face Armagh, who claimed an astonishing 30-point win over Offaly in their last game. The Faithful and Longford are on two points along with Laois and Antrim, meaning any two of the four could face relegation while Sligo and Armagh aren’t safe either despite sitting on five points each. The erratic nature of the result thus far means that Antrim’s fate is still in their own hands and Fitzsimons hopes his side can take a step closer to safety with a win this Sunday. “It is very hard to win away from home in this league. Three of our first four games were away from home,” said the Antrim boss. “We have to knuckle down and try to get a result against Laois. “It is still in our hands. If we keep improving with every game, hopefully we will get there. “There are three games to go. Louth have eight points and are on top and we are on two but there was very little between the sides the last day. “I don’t think we fear any team coming to Corrigan Park. It is about getting the attitude and the performance right on the day. Ryan Murray is Antrim’s primary injury concern ahead of Sunday’s game after picking up a quad injury. However, defender Paddy McAleer could feature after fears he sustained a serious leg injury were allayed. The Ballymena clubman is suffering from a muscle compliant but could still feature while Conor Hamill (hamstring) is also in contention. Sean McVeigh, Mark Sweeney and Kevin O’Boyle are also edging closer to a return but Sunday’s game could come too soon for the experienced trio.